In the focused tunnel vision of the last few weeks I’ve had little time to do much more than eat, sleep and write in a metronomic rhythm which has finally paid dividends. The precious manuscript has been sent off for copy editing, and I’ve just been out for the last ten days tying up a few loose ends. Well a lot of loose ends as it turned out. The list of bothies that needed revisiting grew as I realised how much fact checking I needed, and there were a couple of last minute photo shoots which had been put off, the headliner, visiting the Eagle’s Nest at Mangarstadh on the west coast of Lewis . And again, with the time pressure so tight there was no other option than to hire a car, stick the bike in the back, and bullet up the A9. First stop Hutchinson, with a quick nod to Bob Scott’s as I cycled by, and then onto the Fords of Avon. 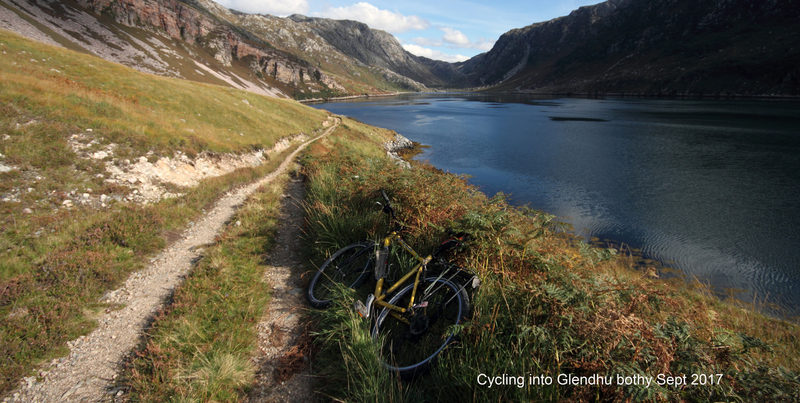 Bike parked at Derry Lodge, but following a recent theme, its straight forward to cycle – to the Hutchie at least – with a few obstacles to negotiate. Then it was on to north west, where I had planned to walk in to Craig or Coire Fionnaraich but in the end decide to car camp at the free site by the Youth Hostel in Torridon. Its so easy! Popped into Leckie and Lochivroan the next day (both have a little side entry), and then I had to get my head around the most luxurious overnight of the whole damn business of the book, a single room in the Ceilidh Place in Ullapool. Alleluia for my finishing milestone advance! I got quite emotional thinking about how much effort has gone into the project, very much aware that at an earlier stage I’d have been cooking noodles on the campsite, and cycling across Lewis over three or four days. But hey, I knew I deserved a treat, and the Cullen Skink was superb! There wasn’t any time to really soak up any sense of the intangible Hebredian magic on the schedule, a blustery night in the bothy was shaken off by a quick morning stroll along the strand at Traigh Uige, and there was just enough leeway for a quiet moment at Callanish before heading back to Stornoway. I felt a twinge of regret that I couldn’t contribute to the survivor stories of a battered troop of cyclists that had made it over moors from Tarbet, but in my heart of hearts I knew I would just have cried battling across the island in the merciless westerlies of the day before, thankful that for once I could just motor through it. The next leg was the real meat in the sandwich, four days fact checking round the bothies of a loose Highland 500, retracing the route of my first cycle trip in the blog back in June 2012. Vivid memories flooded back as flattened the humps and bumps that seemed so epic at the time, I hardly blinked as I reached the bealach under Quinag which had been one almighty effort four summers before, and the steep us and downs before Scourie and after Laxford Bridge passed in an unremarkable blur. Glendhu, Suileag, Strabeg, Achnanclach and The Schoolhouse all received a visit, and the final stop on the loop was one night at Shenavall, walking in with the standard 10 kgs of coal, red wine and a couple of celebratory beers. Only one more objective left before heading home, finding out what is going on at Ruigh Aiteachain. After crashing with master photographer Paul in Inverness, I made it to Auchlean before nine hoping for some seductive morning light, but the clouds rolled in and I was left with the prosiac task of tip toeing past the eroded moraine undercut by the Feshie in last years biblical floods, and a quick natter with two stone masons on site at the bothy. The north side extension is slowly taking shape, but the guys bemoaned the late start to the build, and thought it wouldn’t be finished before next summer…. a no brainer…equation courtesy of Phillip who I met in Inchnandamph and mined for information about his journey north on the Cape Wrath Trail…thanks mate! This entry was posted in pedal to the metal on September 30, 2016 by bothiesonabike. Well done! My next trip to Scotland will use your book for the planning. Ford of Avon looks like a sensible idea (in spite of what it says on the MBA-homepage). Is there a stone floor to sleep on or some wooden planks? No need to reply. The answer is probably in the book.. Cheers! great spot basic shelter, wooden floor not one you are in fear of confined spaces …yes in the book! Got your book in the post yesterday. It gets shipped nicely. Holiday planning started right away. cool! perhaps I’ll see you out on he bothy trail!